Chef Ryan Scott prepares a delicious meal for his friends at a beach campsite. Even though he isn't much of a camper, he puts together a few gourmet recipes for the trip. Ryan is not much of an outdoorsman but his friends have challenged him to go camping for the weekend. So, he heads to Sunset -- the premiere magazine of the West Coast -- for tips on how to prepare a delicious meal without the luxuries of home. Elaine Johnson, associate food editor at Sunset Magazine, shows Ryan how to cook cinnamon rolls in a Dutch oven over hot coals. It is a recipe that requires a little bit of planning since you want to make the dough before you get to your campsite. But, the end result is a warm and delicious breakfast treat. Before Ryan leaves for his camping trip, he preps his food. He starts by marinating his steak in a coffee and jalapeno rub and then he cooks his baked potatoes in the microwave so he only needs to reheat them once he is at the campsite. He also gets his killer tater toppings ready -- bacon, scallions, cheese, sour cream and rosemary butter. 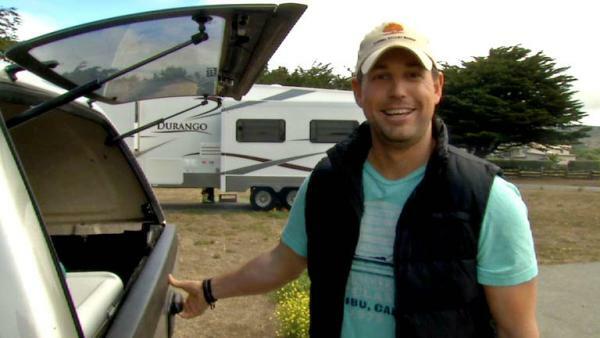 With all the goodies packed in ice and ready to go, Ryan heads to the beachfront campsite in Half Moon Bay, which is just south of San Francisco, for the weekend. Campers at this park enjoy four miles of beach. Once at the campground with his friends, Joe Jacobsmeyer and Anthony Bradley, Ryan gets to work cooking his camp side meal over some hot coals. He starts by making his blue cheese biscuits and then he saut�s his espresso and jalapeno steaks in a pan on a portable stovetop. While the steaks cook, Ryan and his friend start making the dessert -- bananas foster! All of Ryan's recipes were a hit with his friends! Get the recipes he prepared here: Dutch Oven Cinnamon Rolls, Jalapeno Garlic Espresso Steak, Grilled Bananas Foster, Honey Black Pepper Blue Cheese Biscuits and Loaded Rosemary 'Baked' Potatoes. The Primus Fire hole 100 has two powerful burners (each puts out 12,000 BTUs), match-free ignition, and an easy-clean design. Camp Dutch Oven This has feet and a flanged lid to hold coals above and beneath the pot. Sea to Summit collapsible bowls squish for easy transport. You can chop your food on these portable chopping mats. Great coffee starts with freshly ground beans. This unbreakable camp French press extracts lots of flavor from the coffee. For more gourmet camping recipes visit sunset.com. Are you planning a camping trip? Try making dutch oven cinnamon rolls on the grill! Forget about the same old food at the campfire. Go gourmet with this recipe for a jalapeno garlic espresso steak. This is an incredibly easy, no-fail biscuit recipe. It can be baked with or without an oven -- which makes it perfect for camping! This is a classic, decadent dessert with an easy spin set to impress anyone at the campfire dinner. Why settle for the same old thing around the campfire when you can have a tasty potato bar? Try Chef Ryan Scott's recipe for 'baked' potatoes loaded with goodies. Go behind the scenes as Chef Ryan Scott cooks out on the campground.